In the present work there is a technique of the game, aimed at individual development of skills of inventive problem solving. 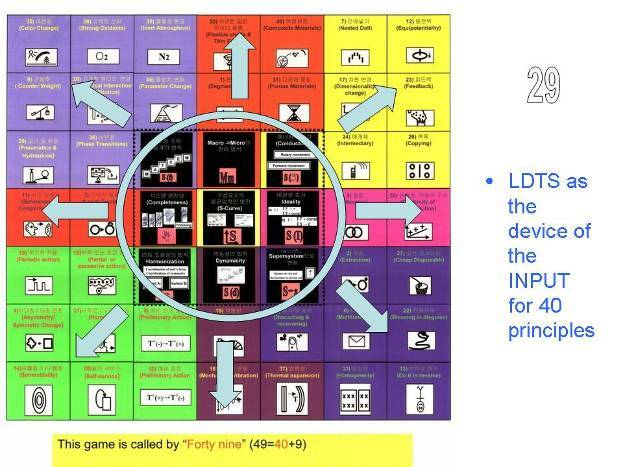 Theoretical basis of this game use the connection of Laws of Technical Systems Development with main TRIZ tools. Great practical experience allowed the authors make resumptive conclusions and bring new game elements in the process of TRIZ investigation. 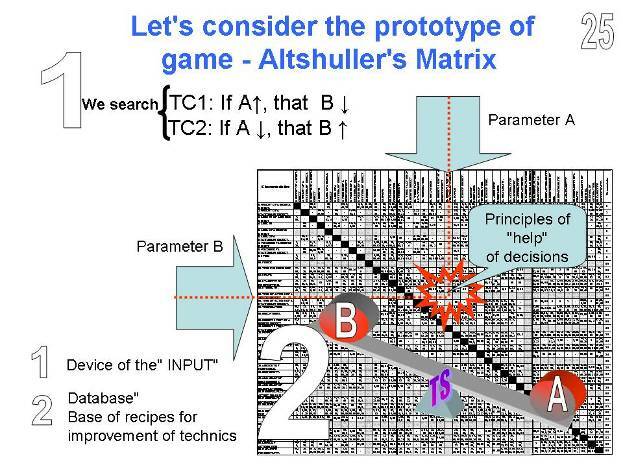 Presented "game-training" is based on the concept use "Harmful Machine" (HM) (1), which is interpreted in quite a different aspect in according with the material presented in the initial work . And improvement of technique – game is also ancient. And the improvement of technique – Infinity. My name is Yriy Danilovskiy, I work as a teacher of innovatives at the Universities of Saint-Petersburg ( Russia) and make evaluation forecasts for Samsung Electronics company, Samsung Electro mechanics company and Russian companies. My colleague and co-author Vasiliy Lenyashin has been working as a TRIZ expert in Samsung Company for 10 years already. 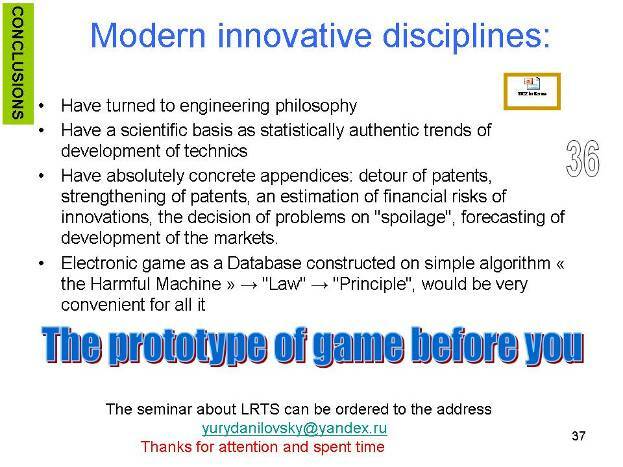 I want to tell you about the technique of individual training of engineers to master one of main TRIZ tools– Code of Laws of Technical Systems Development (LDTS) and get an opportunity to work quicker. 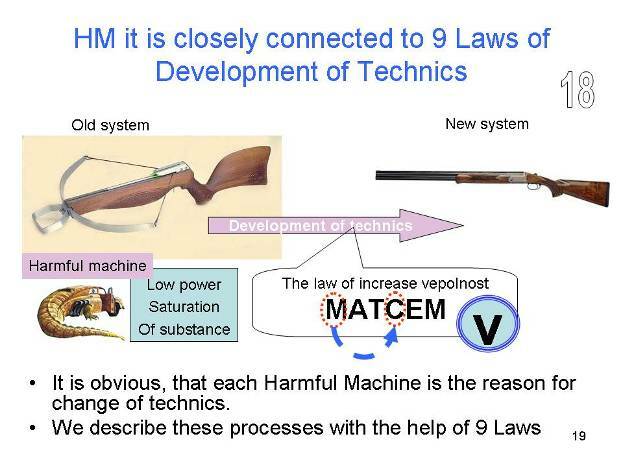 Game – Training I am presenting is based on the concept «Harmful Machine» (HM), which appeared in our working practice in about 2000 y. 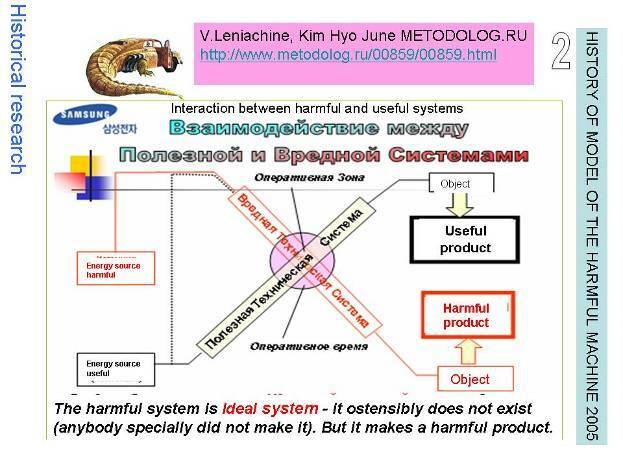 In 2006 the article of Vasiliy Lenyashin and Mr.Kim Hyo June appeared in the magazine www.metodolog.ru where basic ideas were presented. Along with this I thank Mr. Kim Hyo June for the organization of this conference. 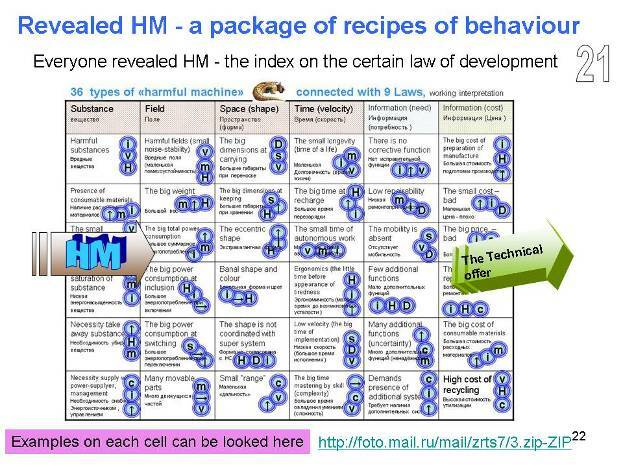 On this slide a very important aspect of HM approach is demonstrated. 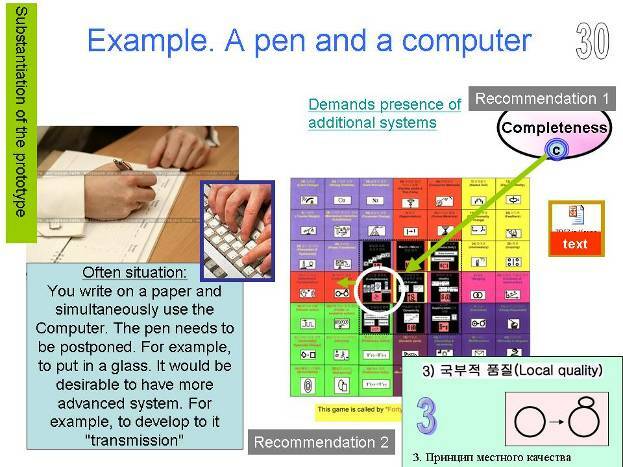 HM exists with the studied TS at the same time and can use in its work one and the same element. If this element is found then the way of TS improvement will be more definite. This approach got a further instrumental development I’m going to tell you about now. 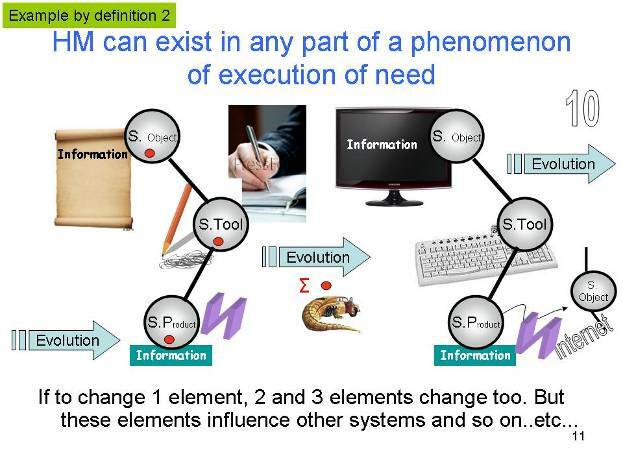 We see 2 definitions of HM concept. The first definition presupposes that in every TS work there is a disadvantage. We can take this as TS and apply to it a condition which is necessary and enough for TS working ability: «Law of through passage of energy». It’s enough to remove at least one connection between WB, Tr, Mot, ES или CS of TS – HM, and we have a new technical solution for the next TS version. The second concept completes the first one. 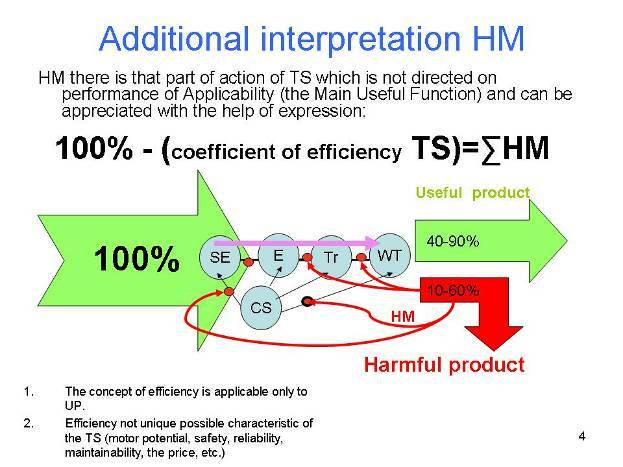 1.coefficient of efficiency concept is applicable only to SS. It’s impossible to appreciate CE of a comb or 3 liter bottle of cucumbers. CE example of a steam motor of a steam engine is 10% but motor resource of a steam engine is more than 1billion km. We keep the opportunity to use instrumental approach of the first concept but along with this we emphasize that HM or Disadvantage is the fundamental reason of technique evolution. 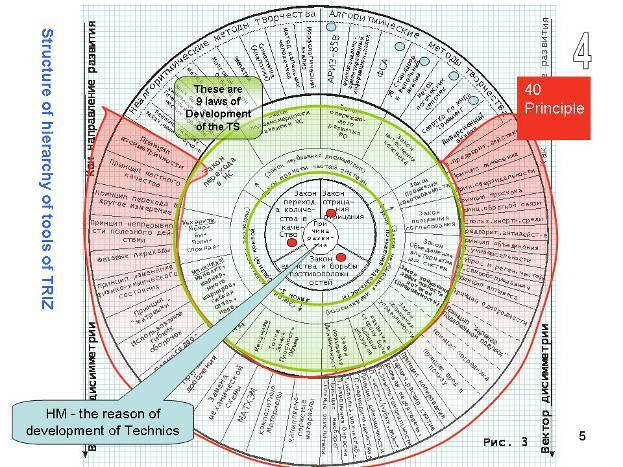 In 2002 there was a research for determining ranks of significance of all TRIZ tools. 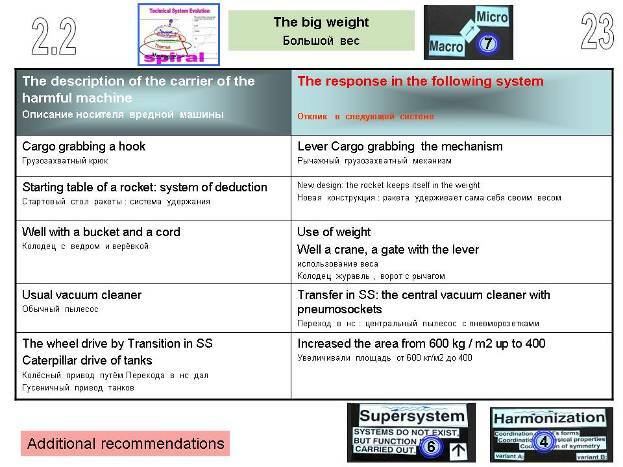 As the result we have two diagrams you see in paper handout material. 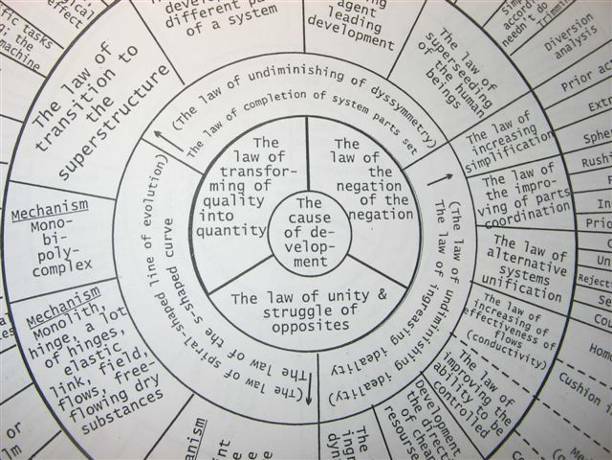 Laws explain WHAT and WHY happens while system evolution and all the rest explain how to make the movement. If we make such a strict division all TRIZ structure becomes more understandable. Along with this, in cause-effect relations that go from the center to the periphery I put in the center a certain Reason of evolution. Today it is possible to describe in details this part of the diagram as a real object. 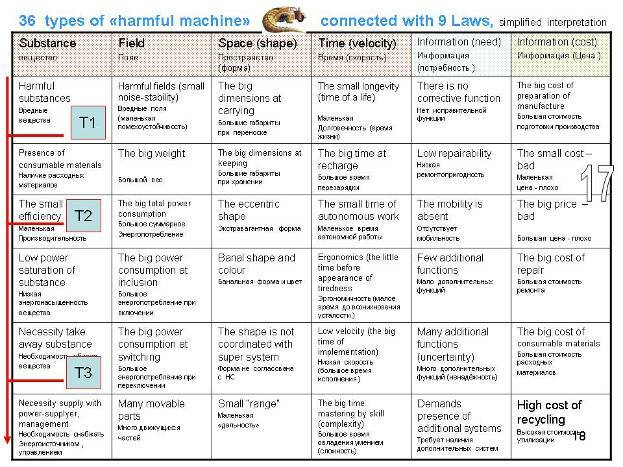 The reason of technique evolution is Disadvantages or Harmful Machines. 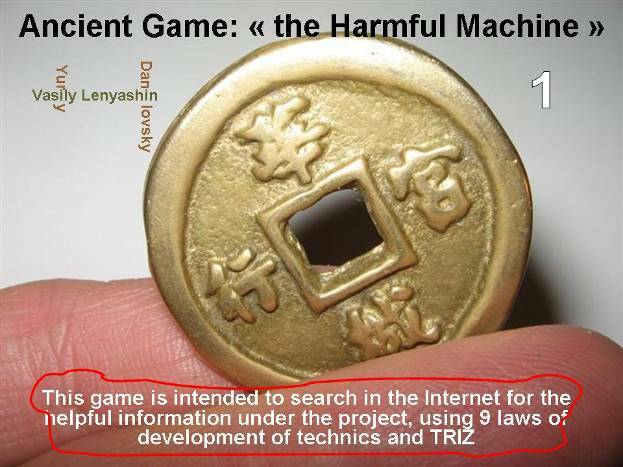 TRIZ founder said that Technique develops in accordance with laws. These laws must be known and used. This statement can be added. People develop technique, first of all, in the direction of disadvantages elimination. This is a complicated process that has a contradiction inside. For the movement along the way of improvement resources are used. 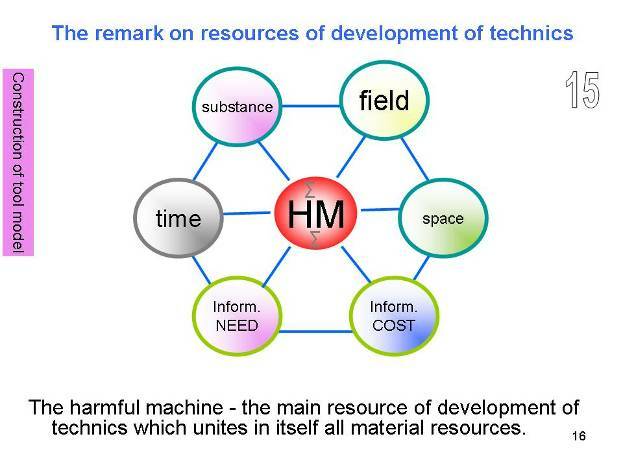 Disadvantage – HM is the resource №1. We’ll discuss this in more details in some minutes. 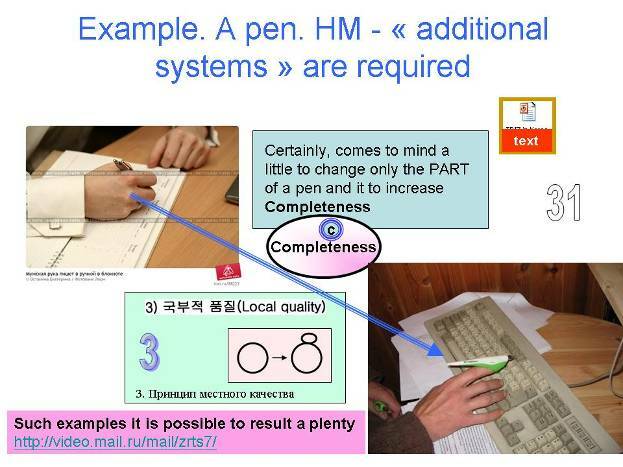 Here are some examples of use of HM concept. When we draw with a pencil we have the attrition of slate pencil. So from time to time we need to sharpen it. Here HM is in the WB zone. 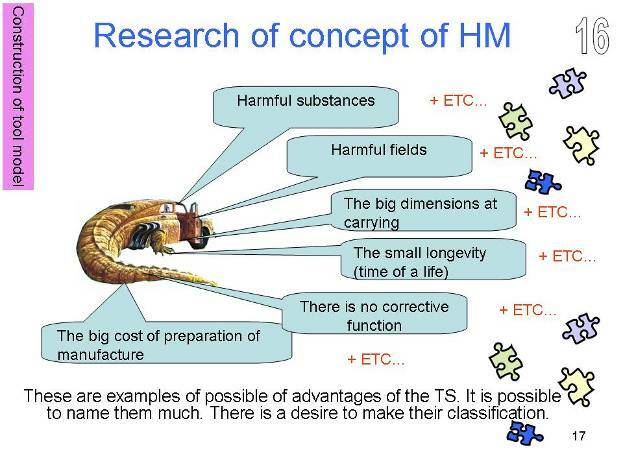 HM is in the same place and produces Harmful product – “thick line”. 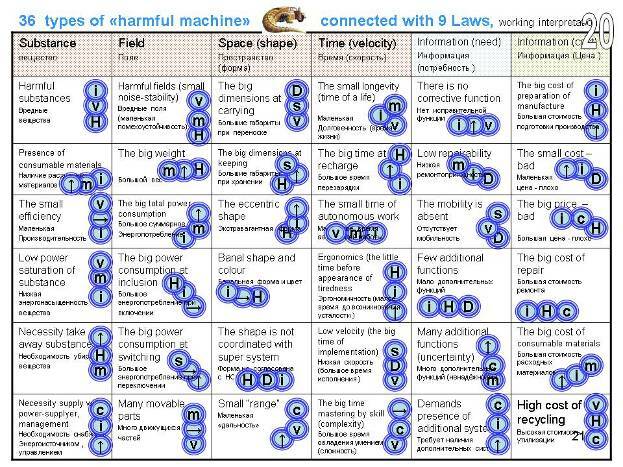 Let’s see Harmful Machine found according to this feature. WB of HM is the tip of a slate. 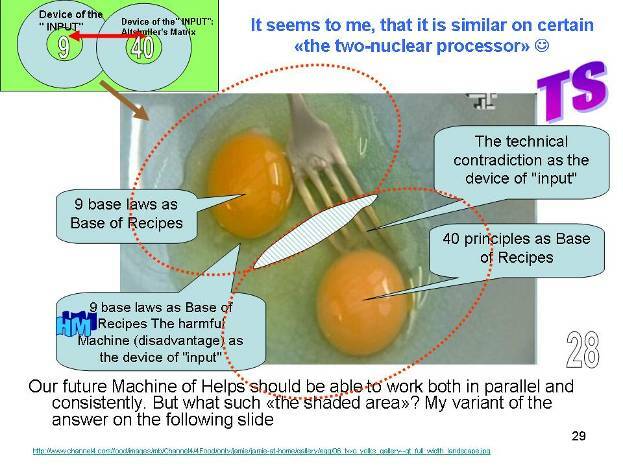 And this is the very «similar element» which exists and in a WB of a Useful Machine. Transfer from a Useful Product to a Harmful one is provided by brining the substance (slate) which is in the hatched triangle fields. 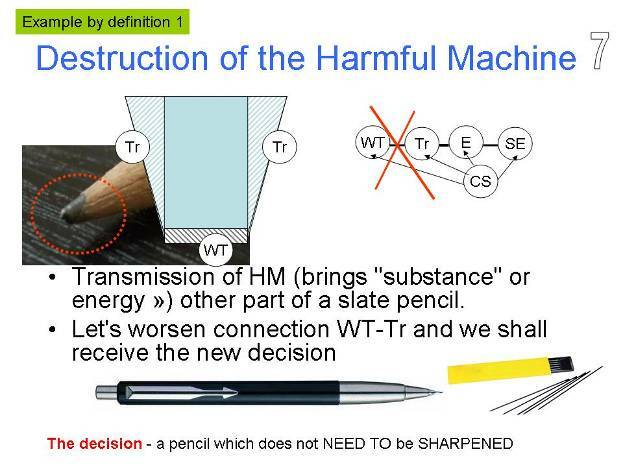 In TS – Harmful Machine these parts of the slate fulfill the function of Transmission. Let’s worsen the passing of the substance on the part Transmission – Working Body. The simplest solution is to change trapeze formed slate (in a horizontal section) into a square formed one. In this case hatched triangles will disappear. Substance for Harmful Product acquiring cannot be brought, but for acquiring Useful Product it is possible. «To use a very thin slate» is a starting idea which caused appearing of the whole class of new pencils. Let’s study one more example. HM here is placed in the Transmission of the Useful TS. 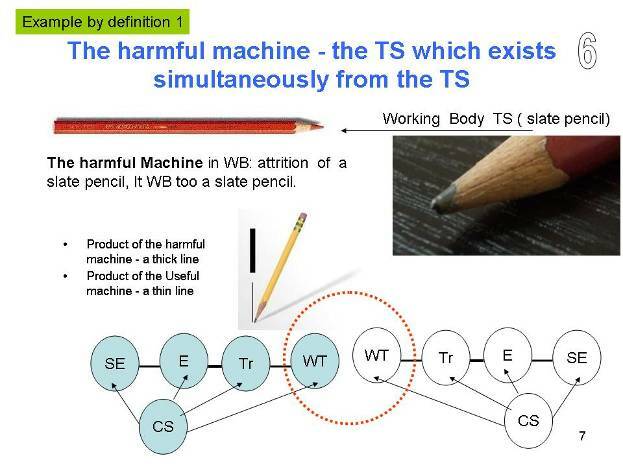 We use the same logic and get TS pencil which can be used without weariness in a finger. HM can exist in any part of TS. This model of studies is very important if we make the project on the forecast of technique development. 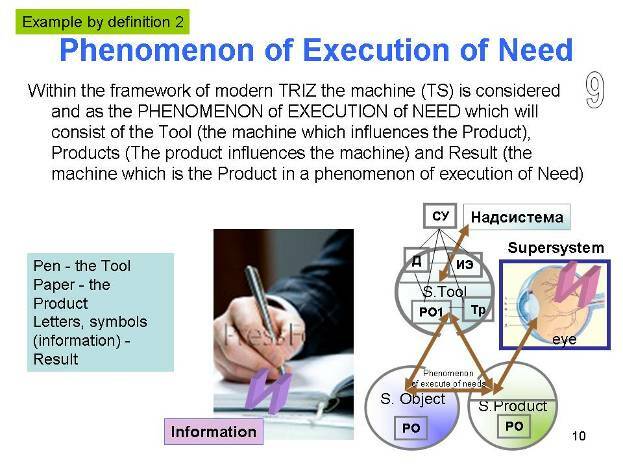 Broadening the definition lets us see HM – disadvantages in all parts of «phenomenon of execution of needs» fulfillment. Let’s remember our first example. 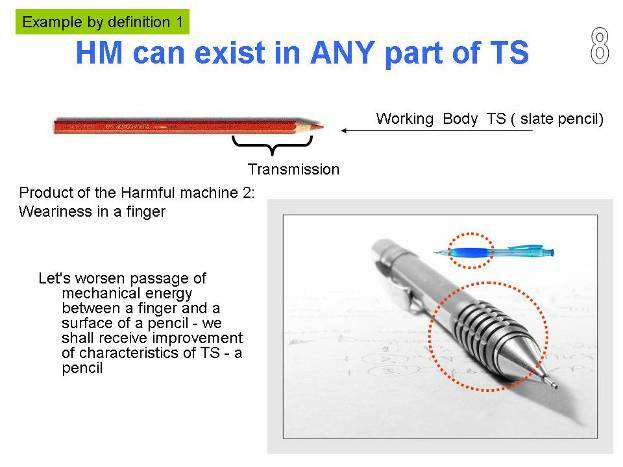 HM was placed in the Working Body of the Useful TS«pencil». But along with this there was HM which was placed on the surface of paper. The more rough the surface of paper the quicker the pen becomes less sharp and needs sharpening. 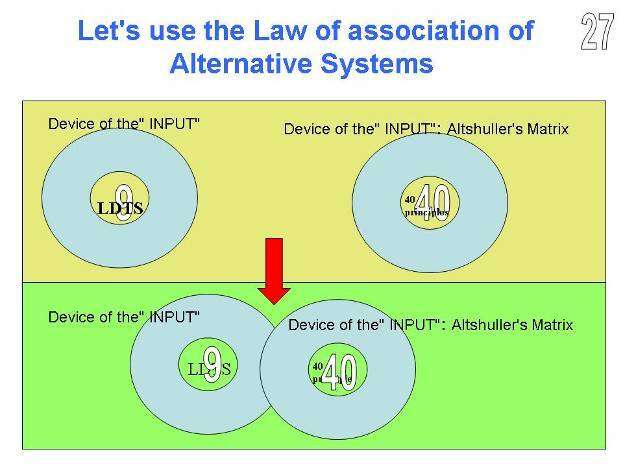 the reason of such transmission is the sum of all Disadvantages which were placed in all parts of the model “Tool – Object – Product”. Let’s study the example where we can simultaneously use both the approach of the definition 1 and the approach of the definition 2. 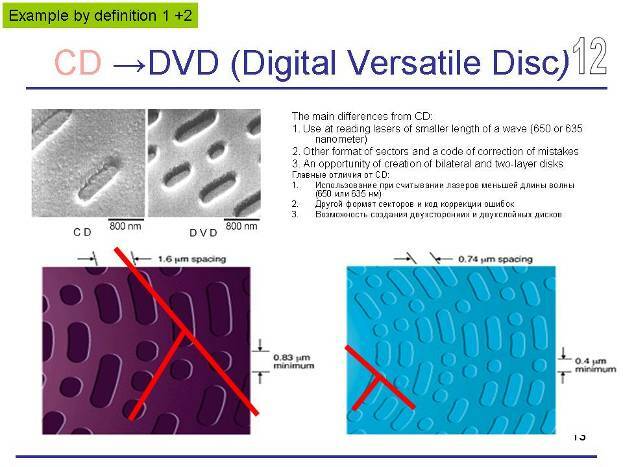 While recording information on the CD disk the Disadvantage was formed and we identify it as “little density of recording”. Let’s present this technology in the form of 3 TS « Tool – Object – Product» and we’ll see that the common element is Laser radiation for making punctums on the surface. To make more punctums it is necessary that wave length becomes less. 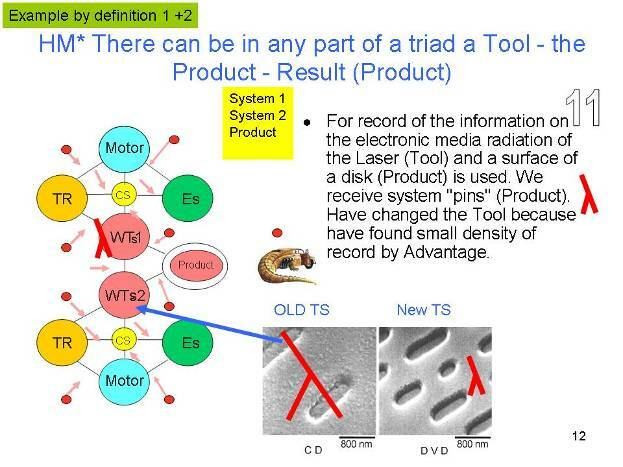 This example illustrates the opportunity of use of HM tool logic for the explanation of transition from CD disk to DVD disk and to all following technologies. If we can EXPLAIN the process of new technique creation with the model so we can use the model to CREATE new technique. Let’s come to conclusions on the first stage of our training presentation. They are on the screen. We’ll act in accordance with the logic of the training itself. 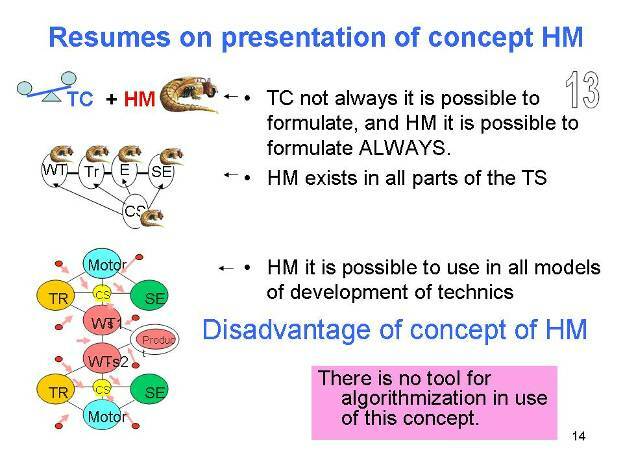 We’ll identify Disadvantage of HM concept as the absence of simple circuits for practical use. To get the simplest circuits of use it is necessary to investigate the object of HM. To classify it by all fundamental resources of technique evolution. 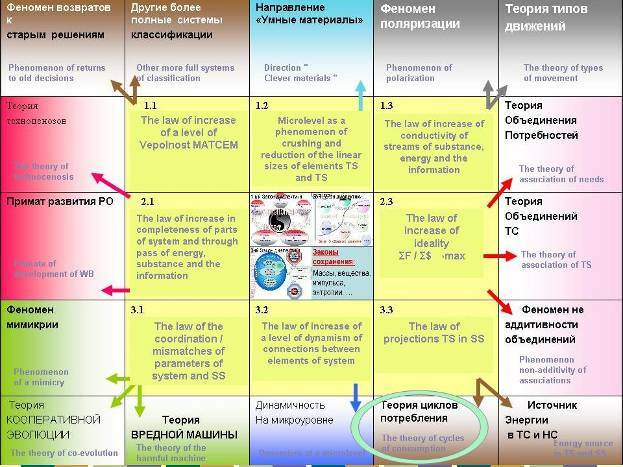 Building the classification by chosen parameters -the taxons is made in the way that it makes possible to use the science about LDTS in the system of all other sciences: Physics, Chemistry, Biology and Economics. 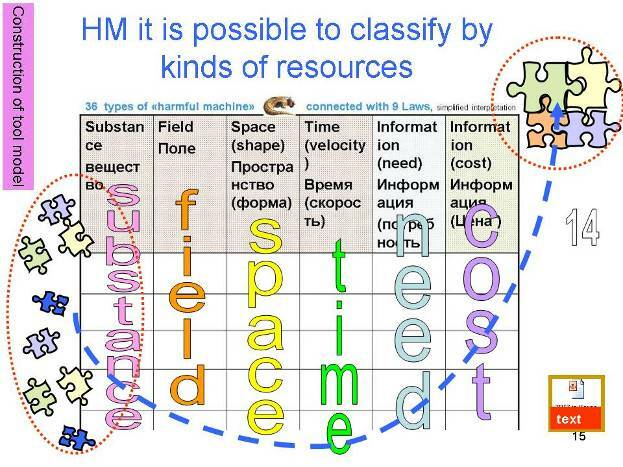 Besides we want that any HM could be described with the help of these kinds of resources as “letters” describe “words”. In such a way the researches were done. We have studied more than 1000 situations of Disadvantage existence and have found that they can be classified by the chosen system of taxons. Along with this we were targeting at the situation where the idea of one Disadvantage wouldn’t cross with the idea of another Disadvantage. After many experiments the matrix has the following image. Every column shows the disadvantages which can be connected in this or that way with the taxon mentioned. The placement from the top to the bottom was trying to classify Disadvantages by « age». Disadvantages of “young” systems differ from Disadvantages of “old” systems. I think that examples here are irrelevant. Young systems try to make as better as possible from the point of view of technical characteristics and old ones from the point of view of price. The next step of research was connected with an important observation. This or that HM causes use of these or those Laws of technique development if we take them as recipes for problems solving but not as simple “observations”. In this case there is an opportunity to connect different HM types with specific, more often used Laws. We have discussed about 1000 facts from the history of technique and tried to build this dependence. After numerous analyses we have the following variant of dependence. The opportunity to make the procedure in one step has been realized. We use the HM which seems to us more perspective in this historical moment and have 3 variants of prompts on the laws found. Prompts let form a new technical offer. There are several examples from the history of technique illustrating the connection of a specific HM and specific Laws. 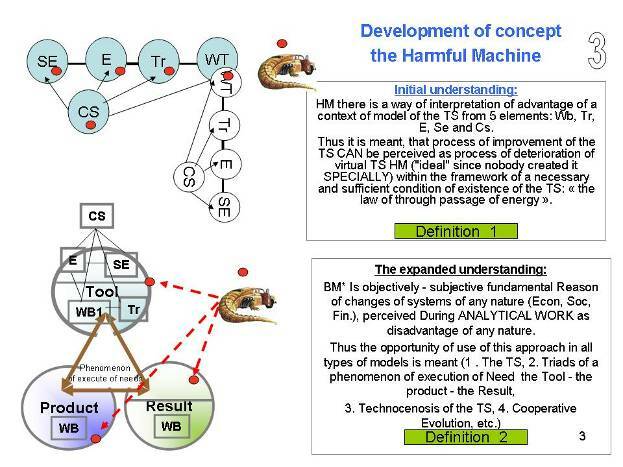 The next example is connected with the problem of weight and using it as a resource of technique development. There are more 30 examples collected on this subject. Russian variant of examples can be seen at our site here. English variant is here. To see additional 200 examples you can see here. 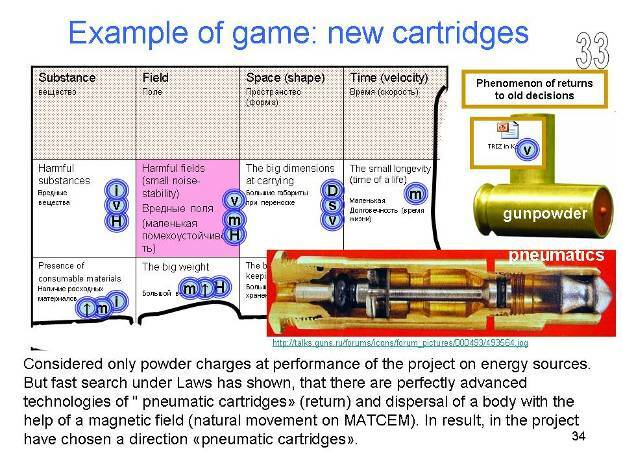 Monolith – hinge – many hinges – elastic band – use of « fields» (MATCEM) –transmission into Super System. 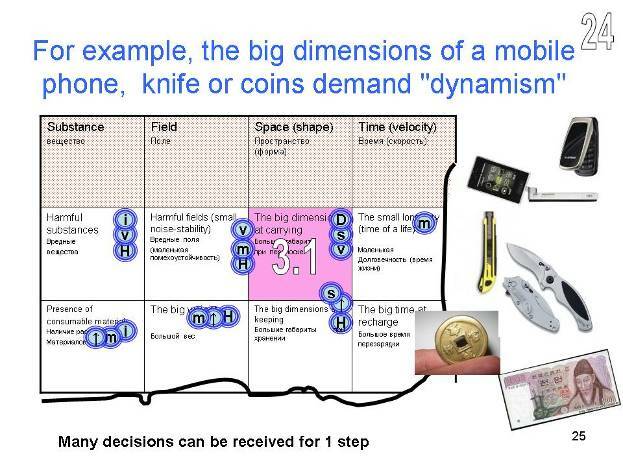 These «accords of scenarios» are applicable even to such objects as “money”J. Coin is a monolith, banknote is “many hinges”. Plastic card is both MATCEM and transition into Super System. «2. Base of recipes for prompts getting». Let’s make comparison of two trainings with the help of a simple table (matrix). getting. Besides the bottom picture caused our humorous association. Application of humour is described by principle № 17 « Transmission into another dimension». This is useful not only in technique but in scientific researches. The example of the training which shows HOW laws are connected with Principles can be seen at our site here. This is a very old training. It was worked out in 2004. Then it was renewed several times. Variant of Laws and Principles classification is made on the base of individual experience and doesn’t pretend to have a perfect scientific precision because it reflects author’s communication style. 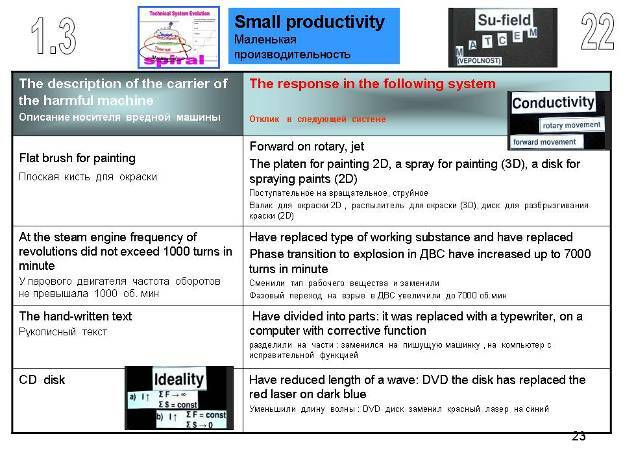 Let’s give an example of use of this additional training for the description of results of technical creativity. « Requires the presence of additional systems». One of recommendations on Laws is the increasing of Completeness. Diagram Games 49 gives a prompt at Principle №3. The solution on this chain (HM 5.6 → Principle № 3) can be like the one demonstrated on the slide PEN + THIMBLE. We’ll make an important remark. 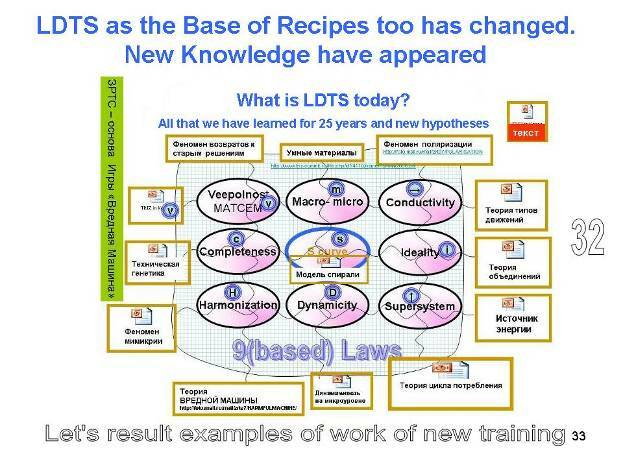 The base of recipes of solutions made in technical creativity which we name LDTS has greatly changed for the last 25 years. Many new knowledges which complete our initial ideas of 80es и 90es appeared. 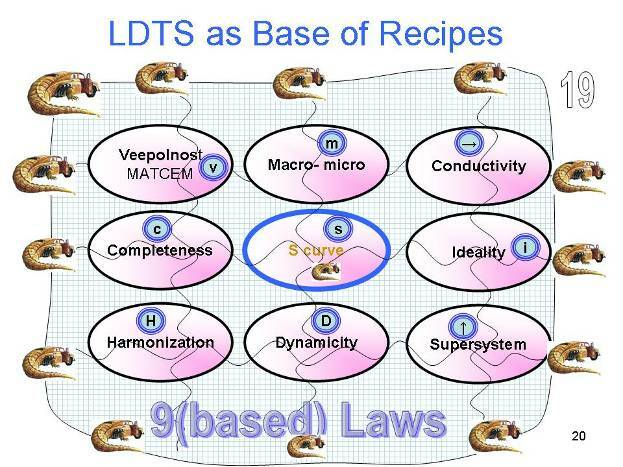 LDTS system we use in forecast projects is based on a new additional model of Law of evolution along the S-curve. These are models of spiral evolution to which my second report at this conference is devoted. Let’s give two simple examples of the use of these new knowledge. In the old system we got used to thinking that technique development strictly follows MATCEM consequence. Nevertheless the model of spiral development requires checking and an opposite trend. This happened while making one of a real project on the ways of throwing a line during carrying out rescue. Refuse from gunpowder allowed making line-throwing apparatus more safe in handling and keeping. It became easy to sell because of the refuse from gunpowder. Here the trajectory of getting HM = 2.1 solution is used (harmful fields as a little noisestability) → Law of increasing of Su-Field interactions in the models of spiral development →Principle № 29 (Pneumatic и hydraconstructions). in R&D of a real fire suppression system. / state «plane»/ or volume suppression by halocarbon, carbon dioxide or argon, vapour, product of combustion (for example fuel in jet engine) /clear state “volume”/is made. 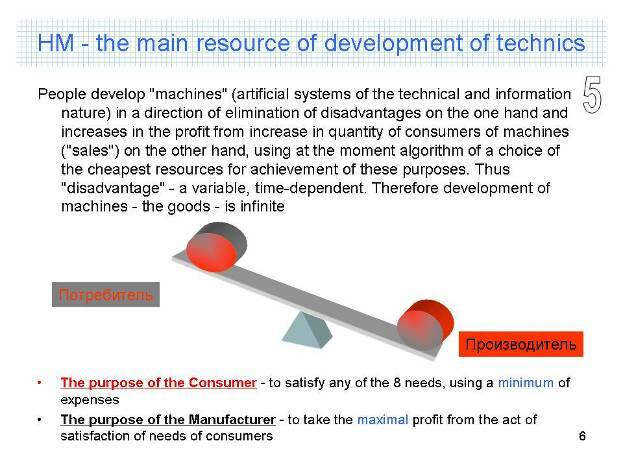 Nevertheless if to suppose the justice of the model of spiral development of technique then the character of searches will be oriented to the state «new point». 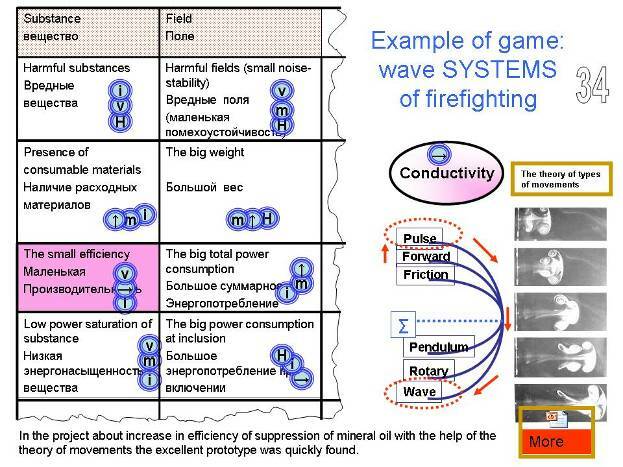 impulsive and wave movements in the next generation of fire suppression systems are also possible. Thus is a searching image of a new system. For this «evolutionary photorobot» ring whirl is more appropriate. Appropriate prototype of high quality was found within 20 minutes. 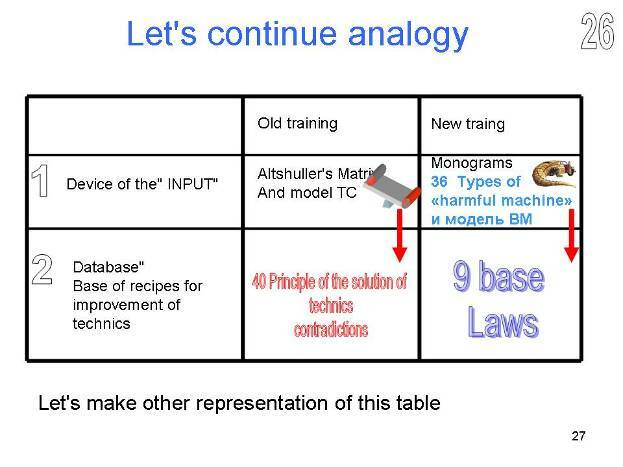 The problem of patent avoiding was successfully solved on the trajectory (HM=1.3 Small Efficiency – Law of increasing conductivity → Principle №7 Matryoshka + №17 Transition into another dimension).